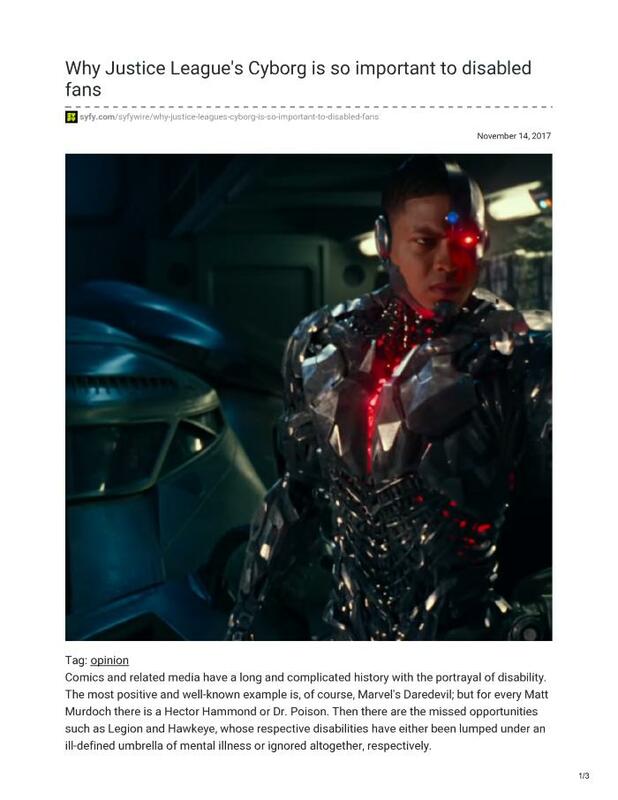 [Image Description: Ray Fisher, who plays the character of Cyborg in the 2017 film release of Justice League, is standing and looking intently at his cybernetic arm, which is glowing light blue. He has on a metal cybernetic suit of armour which contains red lights. There is also a glowing red light over his eye]. Comics and related media have a long and complicated history with the portrayal of disability. The most positive and well-known example is, of course, Marvel's Daredevil; but for every Matt Murdoch there is a Hector Hammond or Dr. Poison. Then there are the missed opportunities such as Legion and Hawkeye, whose respective disabilities have either been lumped under an ill-defined umbrella of mental illness or ignored altogether, respectively. Victor 'Cyborg' Stone is, despite what the forums might say, a very important character. He might not be John Stewart or Vixen or even the Martian Manhunter. But Cyborg is a hero of color whose condition is visible, two things that many disabled characters in comics will never experience. He has more than earned his place in the Justice League through a combination of innate heroism and giving a voice to severely underrepresented groups, especially people who are coming to terms with a new diagnoses.